Spring 2019 Availability and Specials! Garden Center Opening Monday April 15, 2019! There’s lots of popular stories about Sir Isaac Newton and an apple tree. We were able to trace a tree, which is planted on the University of Wisconsin, Madison Campus, and the source for my grafting wood, to Sir Isaac’s home, Woolsthorpe Manor, in the UK. I have visited the Wisconsin tree several times, which gives me a great understanding why Sir Isaac would be inspired to question why things fall down. As the apples mature, they constantly drop from the tree. I could imagine Sir Isaac sipping tea in his garden, while pondering his soon to be proven natural law, “Newton’s Law of Universal Gravitation”, and watching the apples fall from the tree. Who knows, he may have even been struck on the noggin by an apple, shaking loose the law of Universal Gravitation from Sir Isaac’s brain. The apple itself, isn’t bad at all. 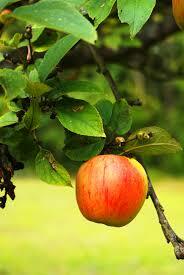 It’s a larger apple that can be eaten fresh, made into applesauce or used to enhance meat dishes. In Madison, WI, the apples seem to ripen around mid to late August. The campus tree also doesn’t seem to have too many pests! These apples are grafted on Malling 7, semi-dwarf root stock. The few trees I do have available are about 4′ tall. We’re grafting more each season to help keep up with demand! Unfortunately, we are not able to get a certificate of authenticity from the British Government. During the dormant season (late fall, late winter and early spring), the tree is shipped bare root (no soil on the root system = less weight and less $ for shipping). It is removed from its growing container and the soil is shaken off the roots. The tree is packed in shredded, moist paper, keeping the tree alive during shipment. Trees can also be shipped while they are actively growing (late spring, summer and early fall). We would remove the tree from its growing container and ship the intact root mass. Of course, that would weigh more and the shipping would have to be sped up, so the tree isn’t in the dark for too long. Each tree comes with planting instructions. Each order also is shipped with a Plant Health Certificate, issued by the State of Wisconsin. The price for each tree is $45.00. Shipping will have to be quoted because of various distances and weight issues. Internet sales may also be restricted by the ship to state, such as CA, OR, HI. We are working with CA and OR to be able to ship these important trees to you. Call us or watch for updates! We do accept VISA and MasterCard. To order, please call our toll free line: 1-888-858-9927.